Most cleansing bars use Palm Oil. Milk Relief Soap™ does not. You may buy Palm Oil Free Soap here on this site by click in this link. We are sufferers of eczema, psoriasis, asthma, hay fever and skin sensitivities. 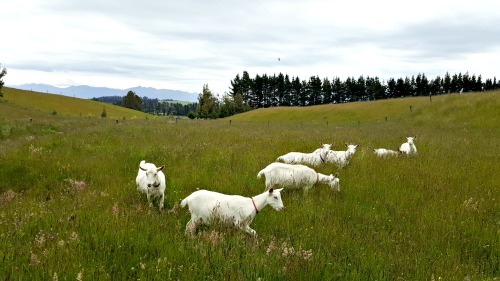 We are also enthusiastic dairy goat keepers who deeply care about animals and the environment. We stick to what we are good at. One soap and nothing else. If you like fancy scented soaps in all manner of colors and shapes, this site is not for you. At Milk Relief Soap™, we stick to one formula only. We know what works, and our purpose is to produce unscented mild moisturizing soap for those who can’t use commercial soaps because of their super-sensitive skin and noses. Milk Relief Soap™ is great for everyday use as a facial soap, body wash, hand soap and shampoo. As a shampoo, one bar of Milk Relief Soap™ gives the number of usages equivalent to 500 ml (17 fluid oz) of conventional liquid shampoo, so it is unbeatable in value for money. Can you trust the soap or body wash you see at retail stores? Do you have confidence in your soap or body wash? Do you feel happy using the same product you use for your baby or children? Well, in 1996, we didn’t have confidence in the soap we used when our first child was suffering from severe eczema. There was just no way we could have used soap on him with the kind of soap we had available in New Zealand at the time. That was before the Internet era, and we had a hard time locating just a simple plain bar of soap with no synthetic additives, perfume or colorants! But now we have the Internet. Today, buying of all manner of items has become a lot easier with search engines and online stores. Even so, finding products that are truly good for your body is still a bit of a task. You still have to go out of your way and search through friends’ referrals or through the Internet. That is why we are here. The research we did into natural cleansing solutions (without the help of the Internet) back in the early days paid off, because in those days there were only two people in our household with skin trouble. Now there are ten of us with allergy-prone skin. So if we let our hands come in contact with commercial soap, shampoo, laundry or dish detergent even once, the consequences are immediate. Some of us will suffer for days, weeks or even months afterward. You can see what a personal interest we had in making sure our personal cleaning option was of the absolute highest quality. This store was born out of necessity, which is of course the mother of invention. Because of our experiences and research, our passion now is to serve individuals and families across the world who need a palm oil free, gentler alternative to fancy scented soaps. I love the rich, silky lather. It makes me feel like I’m pampering my skin. “Milk Relief Soap™ is truly a relief. It does not bother my allergies like many other products I’ve tried. Even so-called unscented products often have strong chemical scents. Milk Relief Soap™has virtually no scent at all. And when I got it in my eyes, I found it barely more irritating than water. I love the rich, silky lather. It makes me feel like I’m pampering my skin. I would definitely recommend Milk Relief Soap™ to anyone that wants a gentle, natural soap. What about glycerin soaps? Aren’t they good for you? On the contrary, the mass-produced counterparts have glycerin taken out in order to speed up the curing process, and this glycerin is then used as an ingredient in skin creams and more expensive soap products. That is why common bars of soap can leave your skin dry and tight, which of course makes you dependent on skin lotions and moisturizers. Since using Milk Relief Soap™, my skin hasn’t been dry at all and it feels great! We offer nothing but the best. The oils used for our soap are the same organic oils we eat and use for cooking, baking or on our skin. We avoid hydrogenated oils at all costs. We wanted to serve as many families and individuals as possible by making Milk Relief Soap™ available to them at reasonable costs. The Internet has made it possible for those who are willing to think outside the box to search for and acquire the best among world’s products, all from the comfort of their living rooms. Mild maybe, but does it really clean? Absolutely! In fact, that is really the point of using a real pure bar of soap. 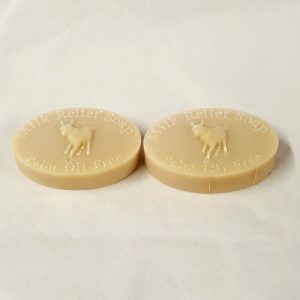 Unlike a synthetic “moisturizing bar” that most people now regard as “soap” at supermarkets, a bar of pure soap has an astounding cleaning ability. Let us show you an example. Here is a photo of our mechanic Jonathan’s hands after he has been working on our car. Milk Relief Soap™ washed his hands clean! Jonathan generally uses a citrus cleaner for his hands at work, and he finds it too harsh for his skin. He was very surprised and happy after using Milk Relief Soap™, and commented how gentle it felt on his hands. Our soap box is made of 100% recycled paper. 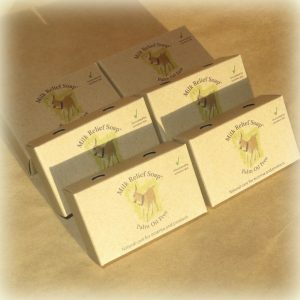 Milk Relief Soap™ comes in a simple box made of 100% recycled paper. We know; we hate plastic, too, and try not to use it wherever possible. Milk Relief Soap™ comes in a simple box made of 100% recycled paper. Nothing fancy but also suitable for a gift. A kid featured on the box is Redarrow Elsie, a pedigree Saanen doe born on our farm in 2009 who turned out to be an outstanding milker. We love her dearly, and she has a very happy life on our farm. Are the shipping costs from New Zealand horrendous? We had to be creative here because New Zealand is geographically isolated from the rest of the world, and shipping anything overseas is frightfully expensive, and vice versa. Some time ago, we found an out-of-print book for $3.65 for a friend in our neighborhood. The location of the book was Ventura, CA, USA. Do you know how much the shipping cost came to? US$43.00!! This is no joke; $43 shipping for a book worth $3.65 (a large book)! The friend wanted it badly enough to pay the cost, because we really have no other choices in New Zealand. Shipping costs have gone even higher since then, not lower. There are two worldwide flat shipping bags available to us in New Zealand: Small and Large. Small can take up to 500 g (1.1 lb); Large can take up to 1 kg (2.2 lb). To ensure you get the lowest possible cost per bar, you choose to fill a Small bubble bag, a Large bubble bag or a box. The benefit to you costwise is that you can buy this unique soap made in the pristine environment in New Zealand without spending a fortune. That is why we have pre-set choices of how many bars or sticks we suggest you purchase at a time. Once you read our Ingredients page, you’ll understand the true value of Milk Relief Soap™. We don’t spend our money on flash TV, billboard or magazine advertising; most of our money goes into acquiring quality ingredients. If you have ever compared the prices between conventional and organic oils, then you will understand what we mean. All prices displayed on this website are currently in US$, GB£, or AUS$. Australia delivery. Items sent to Australia or the Pacific, excluding Asia, please switch currency to AUD (blue flag, at the top of the page. The rest of the world, except Japan and New Zealand should switch currency to USD using the USA flag at the top of the page. Product being delivered to Japan, should be purchased at our sister website, https://goat.jp, or use USD. If you are in New Zealand, please use a separate website here. If you are in Japan, please use a separate website here. Let’s face it. How much do you spend on shampoo, conditioner, facial cleanser, body wash, makeup remover and shaving cream regularly? Have you ever stopped and thought if you really need them all? What if there was a solution which took care of them all, with better results? Most of all, if it was actually better for you and the environment in the long term? Let’s take shampooing for instance. I used to use a brand of shampoo which was heavily advertised on TV. I believed it was good for my hair and would prevent dandruff because the ad said so. I washed my hair every day with it, because my scalp was itchy. Of course I used the conditioner that went with the shampoo. Skin on my fingers peeled badly, and consequently I couldn’t live without the prescription ointment I got from a dermatologist. I have been using just a plain bar of soap to wash my hair for over 15 years now. Instead of smothering my hair with conditioner which merely made me feel I had healthy, smooth hair by chemical means, I used vinegar rinse on my hair after washing to neutralize the alkalinity of soap, with a tiny drop of oil for silkiness. Since I started using our goat milk soap, however, I don’t even use vinegar rinse anymore. I wash my hair, rinse it with hot water, and that’s it. I used to have terrible acne all over my face as a teen. It was quite distressing for a girl as you can imagine. I used to use a bar of baby soap from a very well-known manufacturer because the advertising said it was gentle. It used to burn my skin badly, and my face was a mess. I didn’t know what I was doing. One day, my mother finally noticed how bad my skin looked and was alarmed. She told me to use the expensive bar of soap she was using. It was frightfully expensive even in today’s terms; something like $40 just for a bar of soap. I was made to use the toner from the same brand, and it was even more expensive! They seemed to work OK, but I was only able to use them as long as my parents were happy to pay for them. You know one of these “home parties” you go to where you feel obliged to buy some cosmetics only for the sake of a friend who invited you? Well, I bought a mascara remover for sensitive skin. I used it for the first time just before I attended an important wedding. It was a stupid thing to do. During the wedding, I noticed my eyelids were starting to swell, and by the time photos were being taken, I looked like a different person. My eyelids were so swollen I couldn’t open my eyes properly! I can go on and on with sad experiences like these, but I know better now. You DO NOT have to use expensive-brand anything to get good results. A quality bar of pure soap can do a far-superior job with a fraction of the cost. But please be aware that there is a BIG difference between the mass-produced soap and the handmade soap, even if the former says plain, unscented, hypo-allergenic etc. Use both and compare the difference yourself. You’d be surprised. If you haven’t found out the ingredients for Milk Relief Soap™ yet, now is the time to find out. You will instantly see how simple it really is, by clicking on the link below to see the Ingredients page.